Former vice president Joe Biden slammed the "bonehead idea" of packing the Supreme Court during a 1983 Senate Judiciary Committee hearing, saying the last attempt put into question the independence of the Court for a decade. The remark didn't come during a hearing for a judge, but rather during debate over whether to allow President Ronald Reagan to replace members of the Commission on Civil Rights. 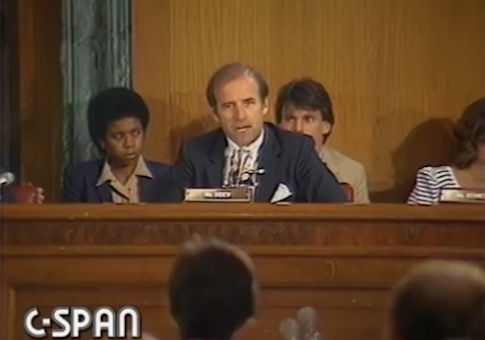 Biden opposed the nominated commissioners not because he viewed them as unqualified, but because he thought Reagan's takeover of the commission would damage its legitimacy. He compared it to Roosevelt's court-packing push, which he called a "terrible, terrible mistake." "President Roosevelt clearly had the right to send to the United States Senate and the United States Congress a proposal to pack the Court," Biden said during the hearing. "It was totally within his right to do that—he violated no law, he was legalistically absolutely correct." "But it was a bonehead idea. It was a terrible, terrible mistake to make, and it put in question, for an entire decade, the independence of the most significant body—including the Congress in my view—the most significant body in this country, the Supreme Court of the United States of America." "We are on the verge of a crisis of confidence in the Supreme Court," Harris said this week. "We have to take this challenge head on, and everything is on the table to do that." Former congressman Beto O'Rourke proposed a dramatic overhaul of the Supreme Court, where each political party would select 5 justices and an additional 5 would be selected by those 10, increasing the size of the bench from 9 to 15. Trump said on Tuesday he wouldn't be considering increasing the number of justices on the Court and that it was just a political ploy by Democrats "to catch up." "The only reason they're doing that is they want to try to catch up, so if they can't catch up through the ballot box by winning an election they want to try doing it in a different way," Trump said. "It'll never happen." Roosevelt's unsuccessful 1937 effort to expand the Supreme Court came after it rejected many parts of his New Deal proposals. Both Congress and the public viewed the effort as an "undemocratic power grab," according to University of Virginia professor Barbara Perry. There have been nine members of the Supreme Court since 1869. Biden's full remarks to the committee can be viewed on C-SPAN. In them, he reiterates his opposition to forced school integration policies known as "busing," saying he actually shared many views with Reagan's nominees for the commission, but would be opposing them nonetheless. This entry was posted in Politics and tagged 2020 Election, Joe Biden. Bookmark the permalink.